Because of the announcement by teachers and workers organizations to hold rally in protest of regime policy towards workers and teachers rights , and beacuse of the fear ,the regime has arrested Mr. alireza Hashemi the general secretary of Iran's Teachers Organization on wednesday Apri 28. Regime security agents have entered Mr. Hashemi's residence on Wednesday afternoon and after searching the house , they took with them the computer and other personal items and transfered Mr. Hashemi to an unknown location. In the past he has been arrested and detained several times . Also Mr. Ali Akbar Baghani the general secretary of Teachers Union and Mohammad Beheshti Langroudi the spoksperson of this union were arrested in their home by the agents of Ministry of Information and according to news , both of them are held in ward number 209 in Evin prison. In the meantime , both Mr. Karubi and Musavi the green movement leadres have supported the teachers and workers rights and both have criticized the policy of the regime of coup d'etat. Save the life of this student.He is sentenced to death! Yousef Rashidi is sentenced to death by the regime of coup d'etat. He is sentenced to death because of holding a paper which reads: " Fascist president , Polytechnic isn't a place for you" . 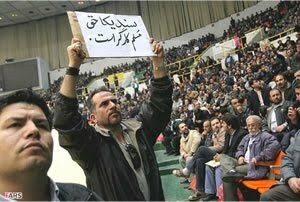 He held this paper in protest when Ahmadinejad visited "Polytechnic University". 30 years after -Islamic Republic regime in Iran still take hostages ! Lets put it this way: While this regime is running , ruining and robbing the country ,all Iranian feel they are the hostage. Six members of the Association of Human Rights Defenders are banned to leave the country. These lawyers put their lives on the line by defending political prisoners without any fee. Statement by Iran Teachers' Union Coordinating Council :Teachers all over Iran will go on hunger strike on Sunday May 2 ! According to news, the board members of Iran teachers union will go on hunger strike on May 2 -8(the teachers Day in Iranian calendar is May 2nd) in protest against execution and illegal imprisonment of our colleagues and on May 2nd all teachers will hold the hunger strike . The teachers in Tehran will gather at the grave side of Doctor Abolhassan Khanali one of the teacher and the teachers in the city of Qom will gather at the grave side of Doctor Motahari . In other citys teachers will hold gathering to honor great educators. Iran Teachers' Union is a member of International teachers Union (EI)and expect sister organizations will support their cause. Iranian teachers are paid the lowest salary and their family live in close to poverty line.Yet they are being harrased and ill treated by Basiji's and "Herasat" office . They face intimidation and imprisonment. 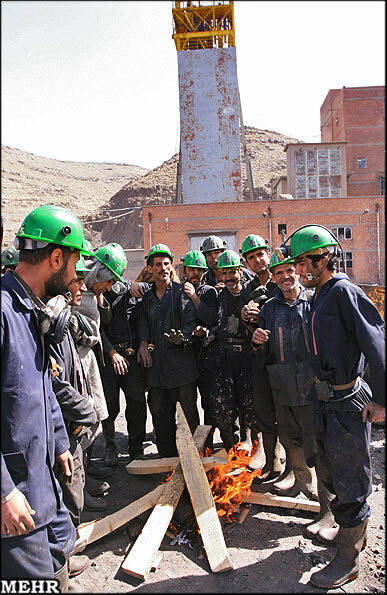 Iranian workers also will hold protest on May 1st ( the International Labour Day ) in front of Ministry of Labour. Blogger one of the world most useful internet blog writing services was shut down in Iran by the Islamic Republic regime ! [Photo]Islamic Republic regime in Iran has shut down Google blogger services for young Iranian. This means total disaster for young Iranian who want to express themselves through blog .The regime is blindly creating an atmosphere for young Iranian to have no other choice but get into the street and protest for their basic rights which is the freedom of expression.IRAN WATCH CANADA condemns this action of the Islamic Republic regime for muzzling further more the freedom of Expression. Iranian workers in green movement are organizing May Day rally ! 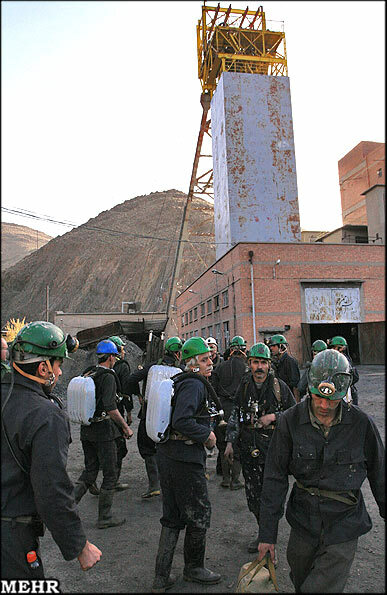 According to the news coming from Iran the "Worker's House" requested for a permission to hold rally on May Day which was rejected by the coup d'etat government of mahmoud Ahmadinejad.Some of the workers in that organization called people from all over Iran to join them in rally in support of the rights of Iranian workers. The program for May Day rally indicate that; We will start the rally at 4:00 pm in front of Ministry of Labour ( in freedom Street) and if the riot police and militias will prevent and create clashes we will move towards Ministry of Interior in ( Fatemi Street). Members of "Worker's huose " in 31 city's will join the May Day rally and the slogan for the day is " Freedom and Justice " . 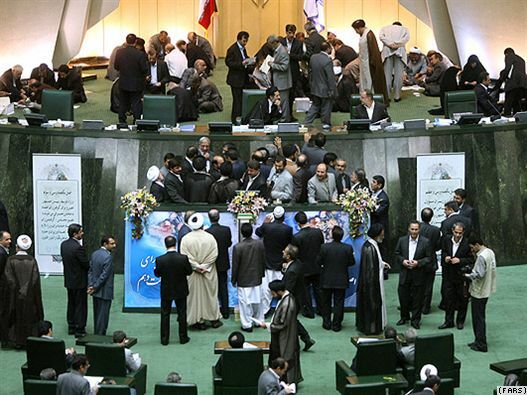 (New York, April 23, 2010) – Iran’s withdrawal from the race for a seat on the United Nations Human Rights Council is a victory for human rights and those who seek a stronger UN human rights body, Human Rights Watch said today. However, further improvements to the council’s membership require giving states a choice of candidates in all regions, Human Rights Watch said. Iran had declared its candidacy for the Human Rights Council in February, and was one of five states from the UN’s Asia regional group running for election this year for the four seats from that regional group. The other declared candidates are Malaysia, Maldives, Qatar, and Thailand. The UN General Assembly will elect 14 new members to the council on May 13, 2010. Under the UN General Assembly resolution that established the Human Rights Council in 2006, council members are expected to “uphold the highest standards” of human rights. 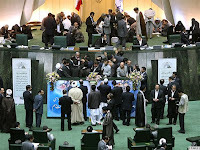 Yet the General Assembly had adopted a resolution last December expressing “its deep concern at serious ongoing and recurring human rights violations in the Islamic Republic of Iran.” The resolution followed condemnations of the human rights situation in Iran by the General Assembly on close to a yearly basis since 1985. A group of prominent Iranian human rights defenders, including the Nobel laureate Shirin Ebadi, had publicly opposed Iran’s candidacy for the council. Mehdi Karubi: We will protest on the anniversary of the presidential election! According to report; 2nd round of protest will start soon in Iran ! We have requested for permision to hold a rally. Although it is quiet now but the society is awaiting for a spark. Mr. Karubi in speaking with Spiegel told : "People must know that we continue our struggle". "Our struggle is for the execution of constitution which stipulate on freedom of expression and democracy", said karubi. Last week the pro-regime propaganda machine falsly published or announced news that ; Karubi is very badly sick. In response to those rumors , Karubi's wife Fatemeh Karubi told reporters that; her husband is in good health and warned if anything happened to her husband or family members the government will be responsible. In the past an armed group stormed Karubi's home and forced the house keeper to open the door while the family were out. Political prisoners decided to go on hunger strike until June 12 (day that shocked Iranian calling Ahmadinejad as the winner of presidential election! 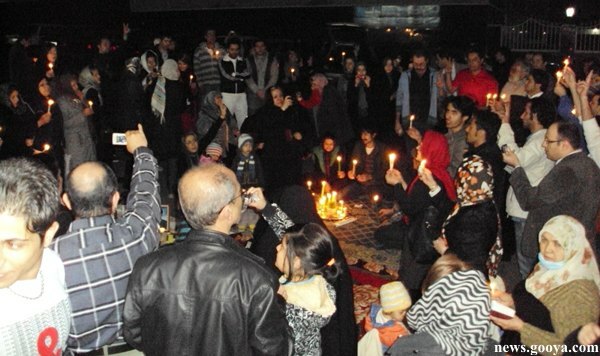 Picture: One of the gathering of political prisoners family and friends behind Evin prison's wall. The political prisoners inside prisons of the Islamic Republic regime in Iran are on hunger strike and will continue until June 12 the day the Ministry of Interior one of Ahmadinejad cabinet minister called ahmadinejad as the winner. This shocked millions of Iranian and one day after cheating the election the people poured into the Streets in all over Iran especially in Tehran more than 4 million protested against election rigging. The political prisoners announced they will start their strike with one day / week ( on Thursdays)and will increase the days ( Monday & Thursdays /week) and as it closes to June 12 the anniversary of presidential election they will intensify the strike. Yesterday was their first day of strike. The political prisoners including those in ward # 350 in Evin prison are doing this hunger strike in protest to prison conditions and prisoners situations. 38,000 cases in violation of human rights only in one month ! 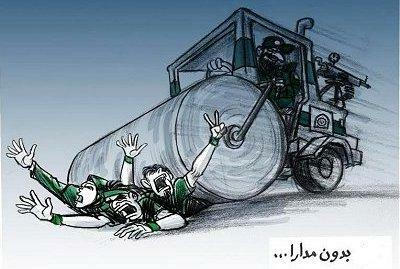 Islamic Republic regime in Iran expect an award from UN ! Perhaps a complimentary /honorary membership in UN human rights council ! 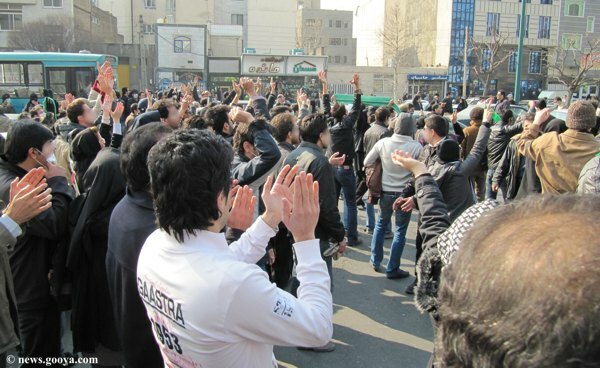 According to the "statistic,publication & works of the Human Rights Activists group in Iran -Hrana" Only in the month of April at least 38,879 cases of violation of human rights by the Islamic Republic regime were reported. In the past month more than 37,519 cases in violation of the rights of workers, 537 cases in violation of the rights of students, 255 cases in violation of the rights of political and civil rights activists ( In the field of freedom of thought and expression), 34 cases of execution and 259 known cases of torture of political prisoners inside the prisons , at least 7 cases of killing of the Iranian citizens who were living around the border , 124 cases in violation of the rights of national minorities and 68 cases in arrest and violation of the rights of religious minorities were reported. According to report , due to the existance of a police state and despite of the wave of arrest and attack on human rights /civil rights advocates this is the least report about the current situation in Iran. Shirin Ebadi's letter to UN general secretary: Reject Iran's request for joining the UN human rights council ! 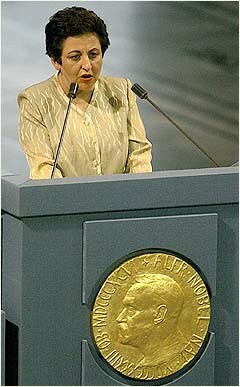 Shirin Ebadi the president of the Association of Human Rights Defenders in Iran and the winner of Noble Peace Prize in a letter to UN general secretary demanded from UN to reject the request of the Islamic Republic for becoming member of the UN human rights council. Now ,this question is being asked; Does the Government of the Islamic Republic of Iran which had commited violation of human rights for years, has the competency to enter into the human rights council? Can a Government that upto now didn't pay attention to United Nations resolutions and ignored them, judge correctly towards the execution of human rights in other countries? At the end she hope that; by rejecting the Islamic Republic of Iran's request for becoming member of the UN human rights council,the UN can bring the Islamic Republic of Iran's attention to their conduct towards human rights violation in Iran and the resolution 64/176 of December 18,2009. It will be an irony and indeed a mockery of human rights if Iran as the main abuser of human rights among the abusers of human rights will join the Commision. But you never know. Life is full of surprises! Membership of Iran into the UN human rights council means the death of human rights . is an intention to get into the UN human rights council . If they admit Islamic Republic of Iran into the UN human rights council , we must doubt on everything, including human rights. According to one report more than 20,000 Iranian protesters have been arrested after presidential election in June! 14-Hesam Tarmesi (Son of: Hamid)One year imprisonment-Family name may read differently. 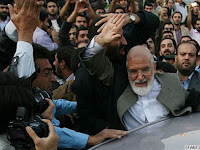 The fundamentalist government of Ahmadinejad prevented Khatami the past reformist president from leaving Iran! 1-Seyed Mohammad Khatami the past reformist president of the Islamic Republic is banned by fundamentalist Government of Ahmadinejad from leaving Iran for Japan to attend in a conference in Hiroshima. This news was reported by "Parleman News " . The conference was organized against nuclear arsenals and atomic bombs. 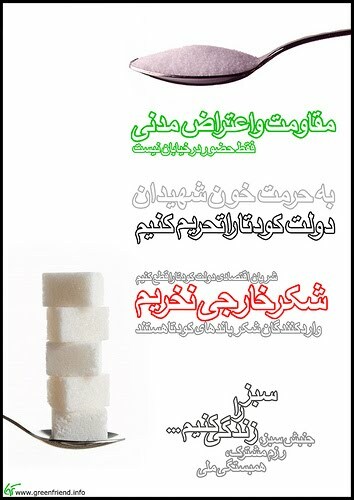 2- The green movement distributed posters which calls all Iranian to boycott buying foreign sugar . The green movement beleives the interest from selling the foreign sugar goes to "Sepah Pasdaran" the revolutionary Guards who are involved in Ahmadinejad's Government.The poster reads: Resistance and civil disobedience. Lets Not to Buy foreign sugar ! 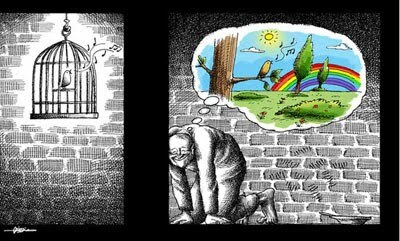 3-The situation of political prisoners in Iran and the prisons condition are the concern of all free loving Iranian these days. we must not forget these political prisoners. According to news published; close to 20,000 people from pro green movement were arrested after the June 12 protest against the presidential election cheating. 4- Workers protest against violation of their rights and delay in payment of their salary continues - around 150 workers from "Sabalan Fabric" factory in the city of "Ardebil" protested in front of the Governors building and demanded their 7 months delay in salary be paid. 5- A member of Dutch Parliament asked Dutch foreign Minister to create a global protest against Islamic Republic of Iran to become member of UN human rights council. Increase in slogan writing "Death to Khamenei" in public places, a poster calling for protest on May Day ( First of May ) ! Death is threatening the life of Behrouz Javid Tehrani one of the student political prisoner who have spent more than 10 years in prison! Can we do something for this young man ? 10 years imprisonment is not enough? Behrouz, we have heard you and your friends in Canada! 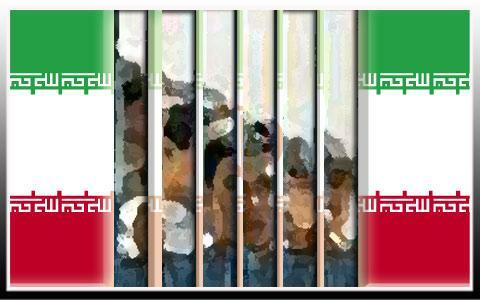 Mr. Javad Larijani, you are the head of human rights commision in the Islamic Republic, can't you hear these prisoners? 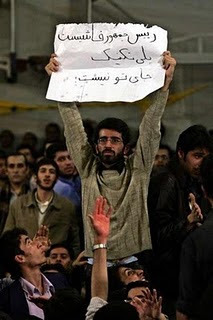 Behrouz Javid Tehrani is one of the student who was arrested during the 6 days student uprising more than 10 years ago. He spent more than 10 years in Islamic Republic prison and had been subjected to various physical and psychological treatment. he went on hunger strike for several times in protest to his imprisonment and ill treatment inside the prison. He is on hunger strike in Gohar Dasht prison right now. There are three other prisoners who have joined Behrouz for hunger strike and their names are: Reza Jalali, Hossein Karami and Mohammad Rezaei. These prisoners are in solitary confinment known as "Sagdoni" meaning "dogs shed or dog house". Islamic Republic of Iran has no respect for political prisoners and it makes the condition of prisons as harsh as possible for .Since no one from international bodies including UN is allowed to visit these prisoners or prisons , the Islamic Republic arbiterarily violate all kinds of laws and rights of prisoners . The Judiciary system and its head Mr. Mohammad Sadegh Larijani , the Human Rights commision Mr. Mohammad Javad Larijani ,the prison officials of the Islamic Republic and the top officials of the Islamic Republic will be held responsible for crime against humanity by ignoring the condition of the political prisoners and their basic human rights. 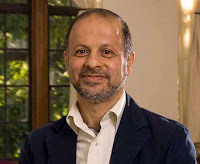 Akbar Ganji, an Iranian writer and journalist who spent 6 years in a Tehran prison for advocating a secular democracy and exposing government involvement in the assassination of individuals who opposed Iran's theocratic regime, has been named the 2010 winner of the Cato Institute's Milton Friedman Prize for Advancing Liberty. Ganji may be best known for a 1999 series of articles investigating the Chain Murders of Iran, which left five dissident intellectuals dead. Later published in the book, The Dungeon of Ghosts, his articles tied the killings to senior clerics and other officials in the Iran government, including former President Ali Akbar Hashemi Rafsanjani. 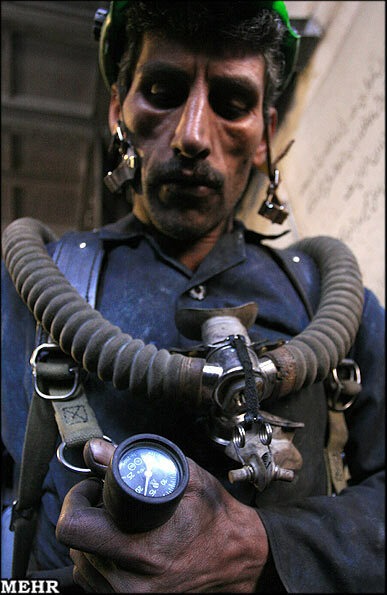 Iranian workers continue to live in a very harsh conditions under the Islamic Republic in Iran. Most of the time they dont receive their monthly salary for months and in some cases like Ghazvin producing factories - Hamid Chinaware, the workers didn't receive their salary for two years. These workers on Saturday have protested against their unfair treatment. 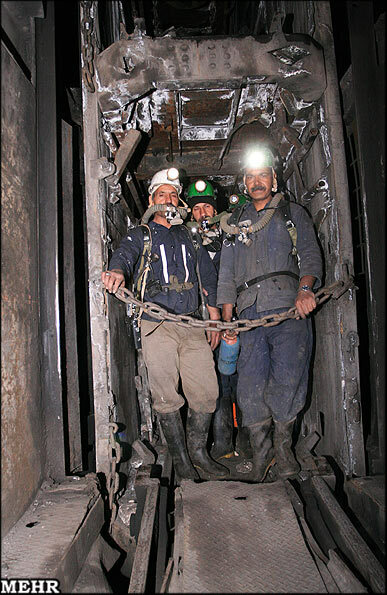 The Iranian workers are working in a low salary , low standard of living and unsafe environment . Release our detained colleagues immediately ! Parleman News" : More than 100 journalists and a group of lawyers demanded from the head of the judiciary power :Release our detained colleagues immediately . Have you seen this video clip?How a young pro green movement Iranian expresses Happy New Year to Ahmadinejad who is addressing his new year message! Al Jazeera sites Wikileaks as releasing footage of a 2007 US military attack in Iraq which resulted in the deaths of 12 people, including two Reuters journalists, Reuters photographer Namir Noor-Eldeen, 22, and his assistant and driver Saeed Chmagh, 40. The footage appears to be filmed from a US helicopter cockpit and includes audio. It is disturbing footage. You can see the full story here: http://english.aljazeera.net/news/americas/2010/04/201045123449200569.html. Reuters’ coverage can be found here: http://www.reuters.com/article/idUSTRE6344FW20100406. Toronto, April 6, 2010—More than 3,500 concerned people from around the world—including prominent international journalists, writers, and press freedom leaders— are petitioning Iran’s Supreme Leader, Ayatollah Sayed Ali Khamenei, to immediately release dozens of journalists, writers, and bloggers currently imprisoned in the country. Among the respected journalists, writers, and other individuals who have signed the petitions are Martin Amis, Jon Lee Anderson, Margaret Atwood, E.L. Doctorow, Jonathan Franzen, Thomas L. Friedman, Nadine Gordimer, Gwen Ifill, Ahmed Rashid, Jon Stewart, and Mario Vargas Llosa. A coalition of free expression organizations delivered the petition today to the Islamic Republic of Iran's Permanent Mission to the United Nations in New York. Petitioners’ names were collected through Facebook and the “Our Society Will Be a Free Society” campaign, a coalition project dedicated to winning the freedom of all journalists jailed in Iran. Additional names of prominent petitioners can be viewed on the campaign website. Our message to the journalists and writers in prison in Iran is that we have not forgotten you" said Annie Game, executive director of CJFE, one of the sponsors of the petition drive. "The Iranian authorities should know that the world community of free expression organisations continues to watch and urges them to end this outrage"
At least 34 journalists were jailed in Iran on April 1, according to research by the Committee to Protect Journalists, one of 16 international free expression groups involved in the campaign. Another 18 journalists were free on short-term furloughs coinciding with the Iranian New Year, but were expected to report back to prison this week. CPJ has been conducting a monthly census of journalists jailed in Iran, now the world's worst jailer of the press. Those interested in joining the petition may still do so by visiting the “Our Society Will Be a Free Society” campaign at www.oursocietywillbeafreesociety.org. Canadian Journalists for Free Expression (CJFE) boldly champions the free expression rights of journalists and media workers around the world. In Canada, we monitor, defend and promote free expression and access to information. We are active participants and builders of the global free expression community. Is it the policy of "come what may" ? what can be seen is that ;this government even ignors its own and pro-government (fundamentalist-Principalist )critics in the parliament who cry to stop the Government not to do what they call it lawlessness or they can see it as a disaster for the country and themsleves. The pages of newspapers in the last two days after 13 days New Year holiday ended, is full of subject such as : The Government must follow the law . 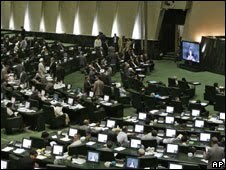 this is with regard to the request by the Government to the Parliament to approve a budget namely " Tarhe Hadafmand Kardane Yaraneha" a plan budget to give 20,000 -40,000 (on dispute)Billion tuman money from the sale of oil to the people of Iran. This plan budget (20,000 Billion Tuman) was approved by the Parliament and become law but now the Government is not willing to do what it has promissed to people !? Even by disregarding the mess this plan budget created and the economical harshness this regime faces this year, it shows how much ignorant this Government is about following the law!? This Government is creating the lawlessness and anarchism in Iran, at least this is what can come to once mind. People has to follow the draconian laws of this regime and yet the regime does not want to follow the law it has created.